Click here for information on Ginny Kahn’s memorial service. 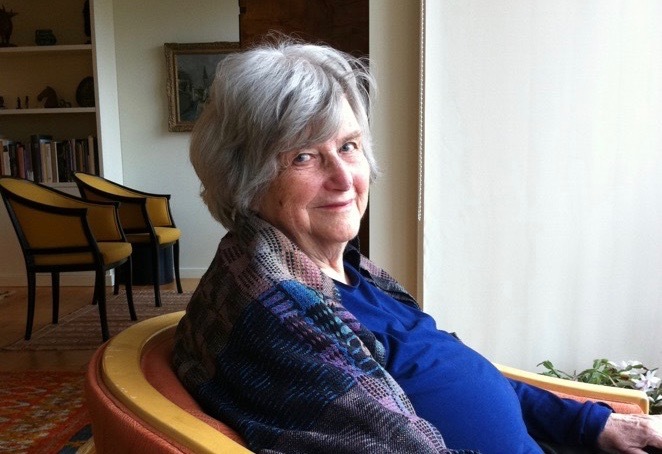 It is with deep sadness—and profound admiration for a life so well-lived—that we announce the death of Virginia L. Kahn, the visionary founder of Atrium School. Ginny, as we all knew her, died peacefully on Friday afternoon at her home in Cambridge, after several days of visits by old friends, family, her dear caregivers, and loved ones. Her charisma, charm, and affection for others remained vital, even as she slipped away. Ginny was 90 years old. Ginny’s own early education in New York City was at the Lincoln School, a beloved place that deeply informed her vision of what schooling could be for children. As an educator, she perennially sought to spark joy in learning, strength in community, and authentic experiences. In 1981, she articulated a desire to reinvigorate empathy in children’s schooling, and in 1982 she founded Atrium School. Ginny served as the first board chair and Bruce Droste was the founding director. Ginny loved to witness Atrium in action, and until very recently she attended musical performances and visited classrooms. She loved having our students visit her at home; often they would quite literally sit at her feet to hear her wonderful stories. More often though, she asked them questions, and she listened intently to their answers. Ginny had an unusually profound respect for all kinds of children, and all kinds of learners. Ginny will be buried in a small, private ceremony for family and close friends. Later this year, Atrium School will join with the Kahn family to host a celebration of her life and legacy. Today, please join me in expressing your condolences to Ginny’s family, and in expressing profound gratitude to Ginny for the extraordinary gifts she gave us all: Atrium the school, but also the Atrium values, experiences, and inspiration that each one of us carries within. In the closing words of her memoir Never a Dull Moment, Ginny writes “I am an eternal optimist and so hope I will live to see us become part of a more cohesive and peaceful world. I am forever hopeful!” Ginny wanted all of us to live in such a world, and indeed, we continue her legacy when we work to make our world more cohesive, and more peaceful.